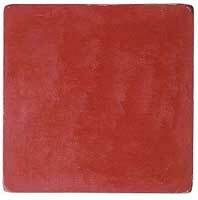 Yves Klein took up monochrome painting at the end of 1949. At the time he described this activity as "a means of painting that is against painting, against all the anxieties of life, against everything" [Stich 1994, pp. 23/253]. Aleksandr Rodchenko's earlier monochromes demarcate the point where art ends, and direct our attention to the uncharted territory "beyond art". Yves Klein re-invents the monochrome as an icon for the end of art, but for him the end of art is not a line which is to be crossed. His perspective is strictly artistic: the end of art is the ultimate stage of art history; it is a space rather than a point. 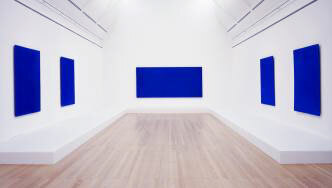 Klein embraces the painting of monochromes as a way to practice art during the end of art. This paradoxical activity has a mystic charge: transcending art = transcending everything = transcending the vicissitudes of life. 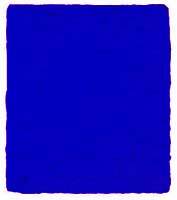 Klein's discovery of the radiance of pure cobalt blue pigment (International Klein Blue) gave rise to his "Blue Period". The IKB paintings create a very intense visual sensation with hallucinatory overtones. They pioneer a new art of "pure light". 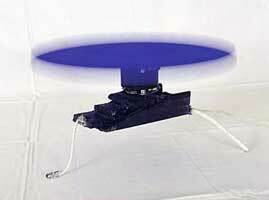 At the same time, they function as conventional, figurative signs: they depict "cosmic space". Yves Klein & Jean Tinguely: From the Exhibition: "Vitesse Pure et Stabilité Monochrome", 1958. More Blue Monochromes, and related work: Pink Monochromes, Gold Leaf Monochromes, Sponge Reliefs. "Participation Immatérielle", Hessenhuis, Antwerp, 1959. "Participation Immatérielle", Galerie Apollinaire, Milano, 1960. 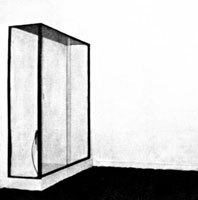 "Zones de sensibilité picturales immatérielles", Exhibition "Antagonismes", Musée des Arts Décoratifs, Paris, 1960. "Raum der Leere", Museum Haus Lange, Krefeld, 1961. Le Vide (Iris Clert, 1958), detail. Yves Klein: Le Dépassement de la Problématique de l'art. La Louvière: Éd. Montbliard, 1959. Yves Klein: Dimanche. 27 novembre 1960. 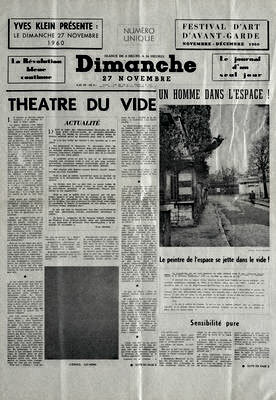 Yves Klein: Le Manifeste de l'Hôtel Chelsea, 1961. Yves Klein: Le dépassement de la problématique de l'art et autres écrits. Paris: École Nationale Supérieure des Beaux Arts, 2001. Thomas Drew Philbeck: A Religious Perspective on the Monochrome. Interculture, Vol. II, March 2005. Pierre Restany: Yves Klein; Le Monochrome. Paris: Hachette, 1974. Sidra Stich: Yves Klein. Stuttgart: Cantz Verlag, 1994.